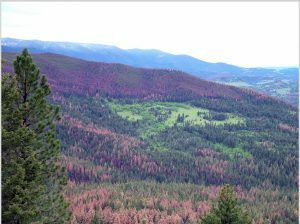 “Each of those subjects – invasive alien species, trade, and climate change – is, in isolation, important to forest health. But in combination, the impacts are likely to be even more serious”, said IUFRO’s Forest Health Division Coordinator Dr. Eckehard Brockerhoff of Scion (the New Zealand Forest Research Institute). Dr. Brockerhoff and Dr. Tod Ramsfield of the Canadian Forest Service, Natural Resources Canada, along with Drs. 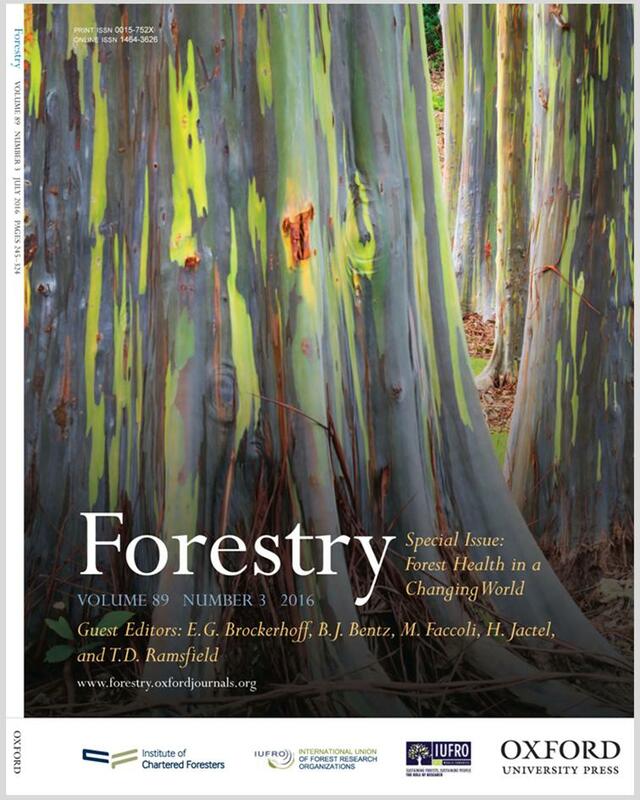 Barbara Bentz of the United States Forest Service, Massimo Faccoli of the University of Padua, and Hervé Jactel of INRA, France, coordinated a special issue of Forestry published by Oxford University Press. Eight of the nine papers in the special issue were initially presented at the IUFRO World Congress in Salt Lake City, Utah, in 2014, but the issues they raise are becoming increasingly relevant worldwide. The articles point out the complex and multifaceted impacts of invasive species. Individually, the threats posed to forest ecosystems by invasive pests are serious. So, too, are the threats posed by climate. At this point, interactions among climate change, native pests, invasive aliens and their outcomes are poorly understood and, therefore, difficult to predict. But it seems clear that the cumulative impacts on forest ecosystems will be exacerbated. For example, we are already seeing the combined effects of invasive species and climate change in the forests of North America where outbreaks of bark beetles and the spread of tree-killing invasive pests and pathogens (such as emerald ash borer and Phytophthora pathogens) are transforming forest ecosystems everywhere. Within the special issue the article by Morin and Liebhold is focused on the impact of gypsy moth on oak populations, but the authors note that the impact of gypsy moth is but one of several factors that affect oak regeneration. “It can be difficult enough to predict how an invasive species will behave in a new territory. Then, when you add climate change to that, it can become even more challenging,” Dr. Brockerhoff said. “While most policy makers are aware of the threats posed by these factors, this special issue underlines the importance of also considering their cumulative effects on a basis of sound science,” he said. The special issue includes articles that illustrate the impacts of invasions of insects and pathogens, climate change, forest management and their interactions, as well as presenting methods to predict, assess and mitigate these impacts. In combination, the papers included in the special issue now present the scientific evidence of the multiple impacts on forest health in a more fulsome manner and so provides further evidence for policy makers and their advisors to consider. IUFRO has nine scientific Divisions. The Forest Health Division (Division 7) includes research on: physiological and genetic interactions between trees and harmful biotic impacts, including resistance mechanisms; biological and applied aspects of tree diseases; environment/pathogen interactions in forest decline; the biology and control of forest tree insects; and impacts of air pollution on forest trees and forest ecosystems, including diagnosis, monitoring, biology, genetics and treatment of polluted forests and other wooded lands. In 2015 IUFRO also established an interdisciplinary Task Force on Forests and Biological Invasions.